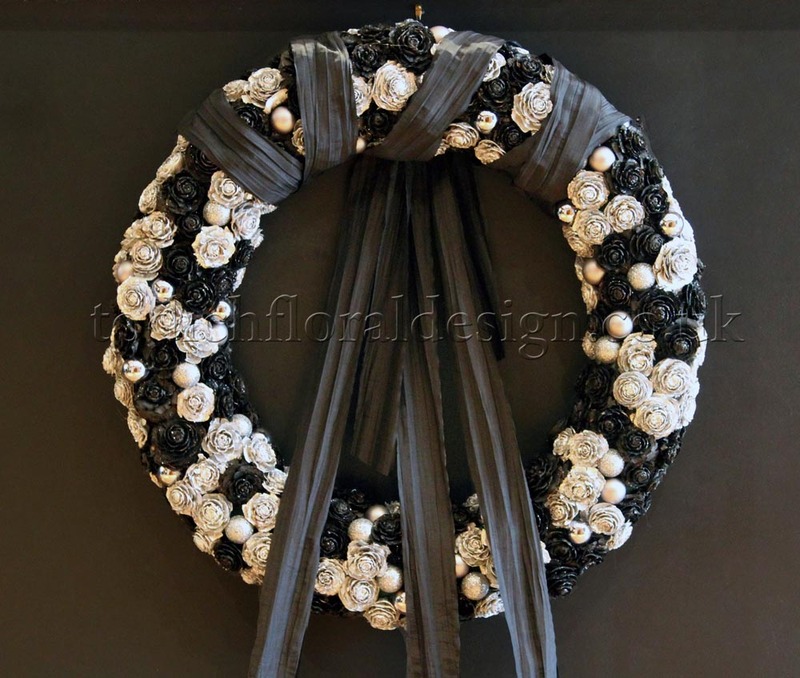 TFD » Blog » Posts tagged "floral fashion"
restaurants, hotels and for media events. Although red, green and gold is the classic colour palette for Christmas, there are many other combinations you can use to give your Christmas flowers and arrangements a fresh and contemporary colour scheme. Deep purples and blues bring a luxurious feel to designs; cool whites, silvers, icey blues and lilacs help set a winter wonderland mood; pinks worked in with reds provide a softer, romantic vibe; and for a really modern look, a simple monochromatic colour scheme can look striking and chic. In terms of materials, twigs, nuts, mistletoe, berries, rose hips, ferns, herbs and of course flowers are additional natural items you can use, plus things like feathers, lace, pearls, crystal drops and of course various baubles and bows. 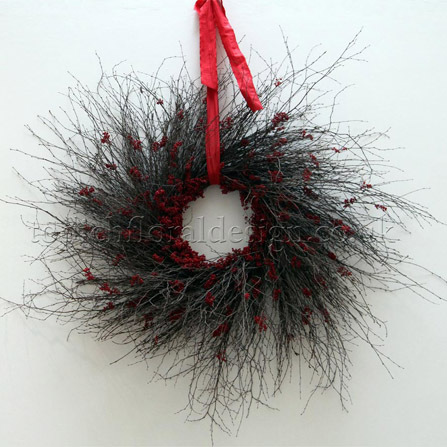 Wild twig wreath with berries or rose hips: it’s possible to buy ready-made wild twig wreaths now which you can then decorate yourself, but if you want to do it yourself, you can create one using chicken wire and moss. Then make some individual bunches of twigs, before wiring these on in a spiral shape. Adorned simply with some ilex or holly berries, or alternatively plump rosehips and a red bow, this provides a really wintery-feeling, rustic display. Natural bark & baubles: Less is sometimes more and when we want to create a natural look, our florists often use pieces of bark. These are easy to find at the flower market or in many shops and can quite simply be wired on to a mossed base. Do this first and then simply wire on a selection of different silver baubles too; a mix of matt, glossy and sparkly and then a simple silver bow at the top is just enough to finish of this design. Purple power: Symbolising power, wealth and nobility, purple brings a luxurious feel to flower arrangements and the bountiful hydrangea, available in a range of colours from light lilac to deeper hues provides the perfect base for a wreath. Add in some roses and black-centred anemones and you really need little more in order to create quite a spectacular, eye-catching design. A wreath full of baubles: OK, so baubles are pretty traditional, but an entire wreath made just from these gives a different twist. And the best thing about this one is the possibilities are endless! You can choose from thousands of different colours and styles, whether you want to create something shiny and bright or in more muted, understated tones. 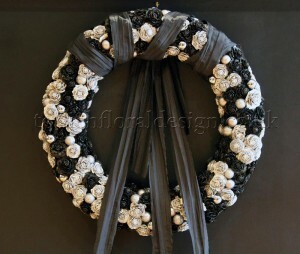 Black and white: Nothing quite makes a statement like black and white and this design, created for one of our corporate clients, was made by glueing sprayed pine cones and baubles on to a dry oasis base. Finished off with a luxurious black satin ribbon wrapped several times around the top quarter and then trailed elegantly through and down the back, it certainly made an impact! Todich Floral Design specialises in creating bespoke designs for corporate flowers, event flowers and flowers for hotels, restaurants and bars. Contact us today for a free consultation. London florist Todich Floral Design had the pleasure of designing beautiful bridal flowers for a London summer wedding this weekend. The new bride contacted our consultants as she wished for our floristry team to provide the flowers for her special day. The bride and groom were getting married at The Thistle Hotel, Hyde Park which was a spectacular venue that caters for many London weddings. The happy couple wished for a country summer theme to be incorporated into her flowers designs. 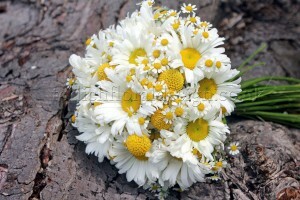 The bridal bouquet was a loose hand-tied posy made up entirely of large daisy heads and craspedia. 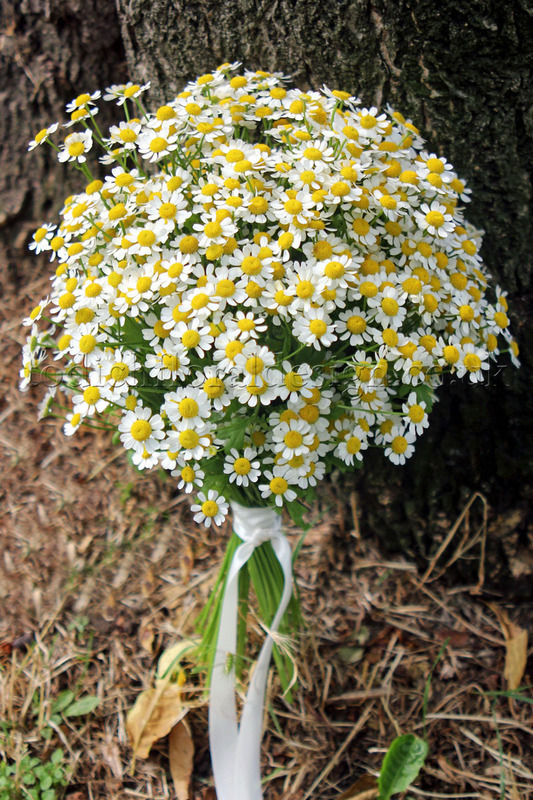 The wedding bouquet was designed to look like wild country flowers that had been hand-picked from an English meadow. The flowers were designed to match the theme of an English country garden and were finished with a sparkling gold ribbon. We created three bridesmaids bouquets entirely with small daisy tanacetum flowers which were tied loosely with gold ribbon and pearl pins. The flower colours matched the bridesmaids light yellow dresses and were very much in trend with today’s floral fashions. 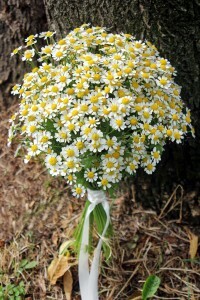 The groom’s boutonniere incorporated the wedding flowers design and included a large daisy flower which was tied with string and gold pearl pins. The floristry team were very happy with the results and the bride and groom were thrilled too. From all the team at Todich Floral Design.